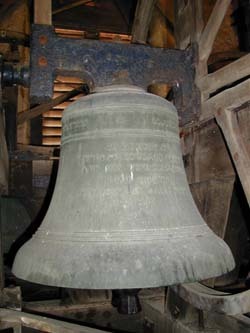 Our bell tower contains six bells, three of which date back to the 17th century. Two more were added in 1937 in memory of the Proctor and Frere families when all five bells were adapted for full circle ringing, the original three being set up for chime ringing. A sixth treble bell was added in 1946. The total weight of the 6 bells is over 1 ton safely installed on a massive oak frame. 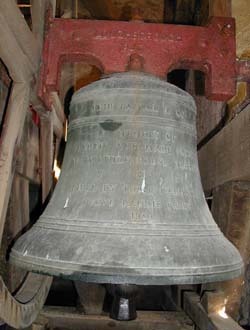 The bells are rung from the ringing floor above the west entrance to the church and two storeys below the bell chamber. Besides the regular Sunday ringing and the special services (weddings, Christmas and New Year) notable occasions are commemorated by longer peals that can take up to 3 hours. A 'Notable Ring' marked the Rev. Clive Slaughter's retirement in October 2001 whilst in November 1999 a 'Full Peal' was rung at Tom Camp's funeral. Other historic national events such as King George VI funeral, Winston Churchill's funeral and Prince Charles and Lady Diana's wedding have been were remembered in this way. Such significant ringing events are noted on peal boards in the ringing chamber. The bells require regular maintenance to ensure their safe and smooth running and the church is indebted to Frank Kirby in his dual capacity as tower captain and steeple keeper. His service schedules include monthly inspections of all mechanical parts, 6 weekly greasing of the bearings, 6 monthly lubricating of the ropes to seal in their natural oils and annual lubrication of the inside washers of the bells. As tower captain he is responsible for organising attendance for the ringing occasions and practices. He also promotes liaison with other bell ringing communities, notably Standon and St Mary's, Stansted. Ken Newstead is the ringing master who conducts the ringers. The bells of St. James the Great have played a significant part in the life of the parish for nearly 400 years of recorded history. Canon J.E.I. Proctor's 1930's church guide speaks of the gleaning bell being rung at 8 a. m. and 6 p.m. at harvest time. No one could begin gleaning - gathering up the leftover ears of corn - before 8 a.m. or after 6 p.m.